Who needs mashed potatoes? Our incredibly decadent whipped cauliflower is so thick, creamy and rich, you’ll never miss the potatoes…heck in no time you’ll be craving these keto mashed potatoes. 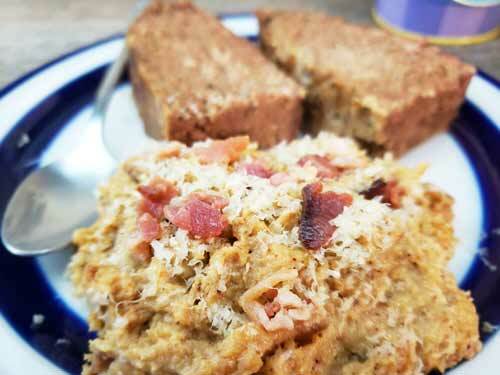 It doesn’t get much more keto-decadent than this: bacon, gouda and heavy cream combine with the roasted cauliflower to create this fantastic side dish. The first time someone suggested substituting mashed cauliflower for potatoes to me, I thought they were crazy. But trust me, this low carb, keto-friendly substitute for potatoes is a sure fire win! 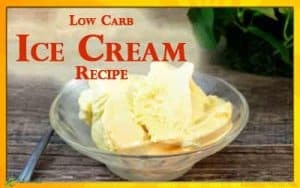 There are a few secret Keto ProTips that take our low carb, keto mashed cauliflower from “OK” to “OMG”. Keto ProTip #1 – Oven roasting the cauliflower. Roasting vegetables in the oven adds a whole other layer of flavor that you just can’t get any other way. Throw in some garlic cloves to roast with the cauliflower, and you up the ante even more. Keto ProTip #2 – Add a quartet of wonderfully rich, flavorful, keto-friendly fats. These truly are the star of the show. Real, rich, pastured butter, heavy whipping cream, aged gouda cheese, and crumbled bacon. The quartet doesn’t even include using the bacon grease to roast the cauliflower. How can you not love Keto? 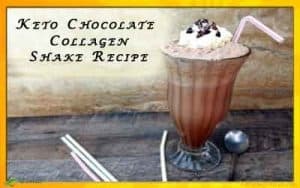 This Recipe is Keto, Low Carb, Gluten Free, Nut Free, and Primal. It’s also simple and ridiculously delicious. Don’t say I didn’t warn you. 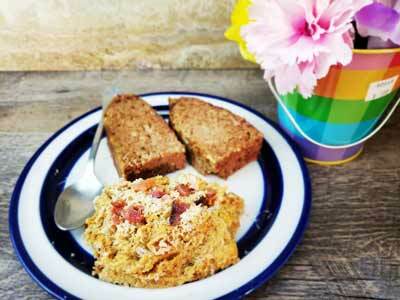 Every batch of this Bacon and Gouda Mashed Cauliflower has disappeared in no time at our house. I have tried to hide some in the back of the fridge, even, to no avail. It’s so good, everyone around here searches it out. 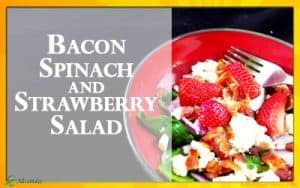 This will be a side dish on our Thanksgiving table, at least for those of us who are Keto. 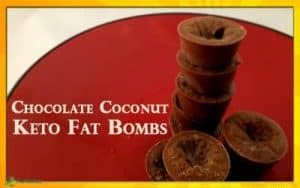 We might just tell everyone else that it’s no good, but we are eating it because we are committed to staying low carb. They can have the mashed potatoes. I’ll eat my Bacon and Gouda Mashed Cauliflower all the way through Christmas! Thick, rich and creamy, this decadent side dish is better than mashed potatoes! Perfect for your holiday table or beside a tender steak. Fry bacon until crisp. Drain on paper towels. Reserve grease. 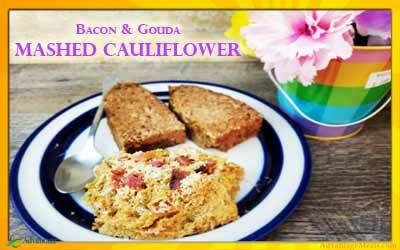 Break up cauliflower into florets and place in 9 x 13 baking pan. Cut butter into about 8 small pieces and space evenly on top of cauliflower. Do the same with the garlic cloves. Sprinkle with salt. Drizzle with reserved bacon grease. Place pan in oven and roast for 30 minutes. Stir and roast for another 25 minutes. Remove from oven and check the garlic. You want it to be very soft and carmelized. Golden brown to dark brown in color but not burnt. If the garlic is done and the cauliflower is also soft and carmelized, do not roast any more. If the cauliflower is done but the garlic is not, turn the oven temperature down to 325. Return pan to oven for 10 minute intervals until garlic is done. Once done roasting, place cauliflower mixture in a food processor along with heavy cream. Process on high until smooth, scraping down the sides occasionally. Crumble bacon and shred gouda. Stir in about ¾ of each. Garnish with remaining and serve. 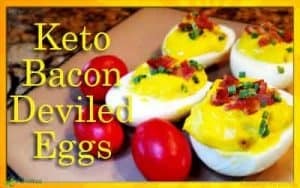 Check out these Simple Keto Recipes!